Young students gathered Friday inside the gymnasium at Buffalo's Charles Drew Magnet School #59 Annex were told they'd be visited by a "super special visitor." It wasn't Santa Claus. 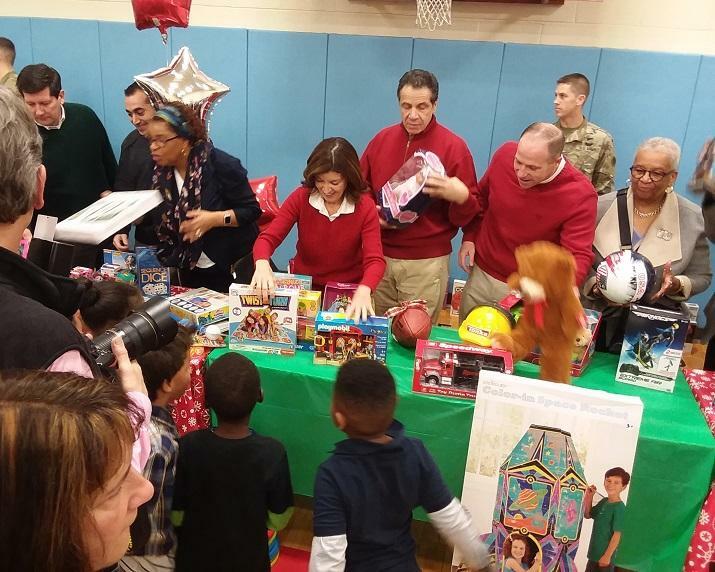 Governor Andrew Cuomo, Lieutenant Governor Kathy Hochul and several local elected officials joined local military members to play Santa and provide toys to students, many of whom the governor suggested might otherwise not have much beneath the Christmas tree. Dressed in red sweaters were Cuomo, Hochul and State Senator Tim Kennedy. Also in red was Erie County Legislator Barbara Miller-Williams. Erie County Executive Mark Poloncarz and State Assemblymember Monica Wallace wore equally season-suitable green sweaters while Mayor Byron Brown donned a silver blazer. Governor Andrew Cuomo looks over the toy he's about to hand out as Lieutenant Governor Kathy Hochul and State Senator Tim Kennedy (at right of Cuomo) join other elected officials and guests to hand out toys to children at the Charles Drew Magnet School Annex on A Street in Buffalo. Not exactly a delegation from the North Pole, but in time that wouldn't matter to the children. Class by class, they lined up and were presented with a toy from the large selection gathered at one end of the gym. Governor Cuomo also went up and down the line to offer some gifts that weren't as desired as others but he successfully spared them from exile on the Island of Misfit Toys. "I've learned certain gift selection skills, which I'm going to deploy with my own family. But this was a lot of fun. The kids were obviously very pleased and they were very happy," Cuomo said. "Frankly, I had a lot of fun because these are children who may very well not be receiving a lot gifts this Christmas because of the financial situation that their family is in." An estimated 475 toys were distributed in Western New York, while overall more than 3,800 items were handed out. They were collected by workers at numerous state agencieds. Toys for Tots also participated. So, too, did the film industry. Film Good/Do Good, a state-organized community service project, set up collection boxes at soundstages in New York City where numerous movies and television shows are produced. Participating shows include Billions, Godfather of Harlem, Modern Love, Instinct, Jessica Jones, Bull, Sweetbitter, God Friended Me, Sesame Street, Orange is the New Black, Madame Secretary and Tales from the City, and the feature film The Joker. "Christmas time, holiday time, I think it's important to step back and remember what we are all personally thankful for," Cuomo said. "Yes, there are things that have gone wrong over the past year for all of us in our personal lives, but there's also a lot of good things that have happened to us. And we should be thankful for that. We should also remember that there are still many, many people in society who don't have the joyous Christmases that we all see on TV and we all hear about. And to the extent we can give back and help people who need help, which is what today is all about, I think it makes the holidays all the sweeter."